Resembling elements of Whose Line Is It Anyway?, Make Me Laugh, and a Saturday Night Live audition, USA’s new comedy competition, First Impressions, pits three impressionists against one another in a $10,000 battle of wits, nerve, and celebrity imitation. The contestants arrive with established repertoires, but the drama of First Impressions is in the ad libs, as a variety of comic setups—fake talk shows, dating-show parodies, names randomly plucked from a bowl—coax the impressionists out of pure mimicry and into the realm of full-fledged performance. Some challenges are better at encouraging this than others, but that’s not First Impressions’ tallest formatting hurdle. As the snackable Chopped to Last Comic Standing’s Top Chef, First Impressions has little time to present the personalities behind the familiar voices. 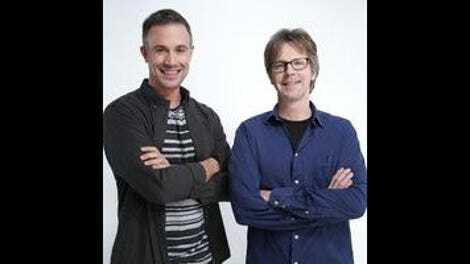 Introductions are dispensed with in a rapid-fire prelude where each contestant runs through a handful of impressions for the studio audience (who determine the winner at the end of the episode), “expert-in-residence” Dana Carvey, and a celebrity guest. (Carvey’s fellow German Who Says Nice Things, Steve Carell, drops by for the premiere, with subsequent episodes featuring the likes of Jay Leno, Yvette Nicole Brown, and Jon Lovitz.) It’s a chance to make an early mark on the studio audience, but it also diminishes some of the fun for the folks at home. These “getting to know you” segments set up a tactical catch-22 for the contestants: Pull out the big guns at the top of the show, and fire them a few more times in subsequent rounds, and you’re likelier to go home a winner. Throw yourself into a wide range of vocalizations and mannerisms, however, and you could be forgotten come voting time. It’s too bad, since every other aspect of First Impressions urges creative versatility. The game of the show involves finding the character within the impression, as Carvey did as SNL’s checked-out Johnny Carson and equivocating George H.W. Bush. Some rounds map that characterization onto the impressions, like the lustful versions of Sarah Palin, Jennifer Coolidge, and Al Pacino that arise during a Dating Game riff. More amusing is an open-ended challenge like “Profession Impression,” which tests split-second decision-making skills as well as spontaneous-monologue abilities. It’s one thing to think “Wouldn’t it be funny if Christopher Walken was a health inspector?” It’s an entirely different thing to pull it off with the wild-eyed commitment of First Impressions contestant Craig Gass. If the show has to come down to playing smart rather than playing imaginative, at least its players are helping to expand the contemporary impression palette. In addition to improv-class staples like Pacino and Walken, the myna birds of First Impressions take on slippier subjects like Kristin Chenoweth, Leslie Mann, and Matthew McConaughey. With so much star power projecting from the competitors, you’d think First Impressions would be better at managing its above-the-line talent. Freddie Prinze Jr.’s hand-clenching emcee work has a ways to go before it’s Seacrest smooth; Carvey, meanwhile, comes off like he’d much rather be out of the mentor’s chair and mixing it up on stage. He’s an active participant in some of the games, but when he’s not, he drops in and out of character as if he, too, were in the running for the prize money. First Impressions relies on Carvey’s expertise but only wants his pep talks, a limiting role for the guy who’s supposed to be the face of the series. Despite its shortcomings, there is a “let’s put on a show” charm to First Impressions. It’s not quite ready for primetime, yet it feels like it should already have 100 episodes in the bank and be airing every afternoon. Let the rough edges (and the weirdly persistent shout-outs to USA reality star Todd Chrisley—twice in two episodes!) blur, and First Impressions could make a decently entertaining summertime distraction. Starring: Dana Carvey, Freddie Prinze Jr.